The calming beauty and striking colour of Emerald make it one of the four major precious gemstones, alongside Diamonds, Rubies and Sapphires. In this guide, we explore Emerald’s defining characteristics, its history and cultural significance, as well as tips for buying and taking care of emerald jewellery. Emerald in a quartz and pegmatite matrix with prismatic crystals. Emeralds are part of the beryl mineral family. Beryl in its purest form is colourless and is called “goshenite”. Beryl only becomes Emerald with the addition of chromium mineral deposits. The chromium impurity is what gives an Emerald its green colour. There is also beryl with vanadium impurities that turn the mineral green, much like an Emerald. However, there is a debate in the gemologist field and jewellery industry over whether such stones should be considered Emeralds or merely “green beryl”. An emerald from Brazil with a slight bluish colour. It’s generally accepted that an Emerald needs to fall within a given range of green to be called an Emerald. Whilst it can have blue or yellow tones, due to the presence of iron deposits, if the green is too light or pale, then it is called green beryl instead. On the Mohs gem hardness scale, Emeralds have a score of 7.5 to 8. This makes them fairly resistant to scratching on their surface. By comparison, Diamonds have a score of 10 out of 10, whilst Rubies and Sapphires are a 9. Even with this relatively high hardness rating, Emeralds are known to be fragile. This is because of their internal flaws or “inclusions”. It is quite common for Emeralds to have inclusions, and these include air bubbles and fissures within the gemstones. Such inclusions make Emeralds easier to crack on their surface. A rough emerald with prominent inclusions consisting of CO2 gas bubble and salt crystals suspended in a fluid. Fortunately, since the presence of inclusions are expected they do not bring down the value of emeralds the same way they do Diamonds. In fact, the complete lack of inclusions can signal that the emerald in question is synthetic or not even an Emerald at all. Inclusions that have an aesthetically pleasing pattern can even increase the value of certain emeralds. Gemologists have come to call them “jardin” (French for garden) because of how elaborate they can be. Generally though, the fewer the inclusions, the higher the price an emerald can fetch on the market. Emeralds were first mined in Egypt, India, and Austria, but a vast majority of emeralds in the modern age come from Colombia. Over 50% to 95% of the world’s emeralds are mined from the South American republic, with the number fluctuating yearly. There are three major mines in Colombia that produce high-quality emeralds: Muzo, Coscuez, and Chivor. Emeralds from Muzo generally have a yellowish green colour, while Chivor Emeralds have a bluish green colour. Colombian Emerald mines are also known for producing a special kind of Emerald known as the Trapiche Emerald. These Emeralds have dark lines that emanate from a black centre in a star-like pattern, caused by carbon impurities. Only the Boyaca Emerald mining district can one find such Emeralds. Zambia, Zimbabwe, and Brazil are the other major suppliers of Emeralds. The word “Emerald” traces its roots all the way back to the Ancient Greek word “smaragdos”, which translates to “green gem”. These gems were first mined in Ancient Egypt on the slopes of Mount Smaragdus around 1500 BC. 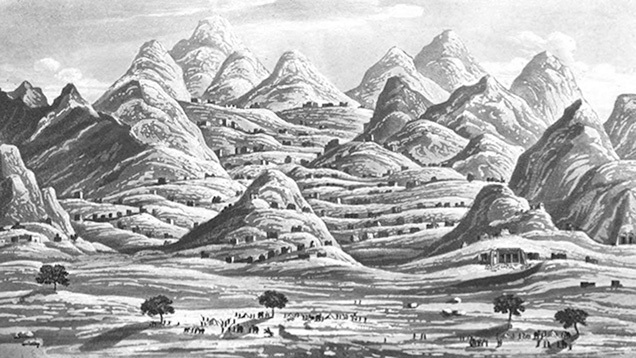 An 1817 illustration of Mount Smaragdus, the ancient emerald mining mountain in Egypt. Cleopatra was known for her love of emeralds. She wore emerald jewellery with pride and decorated her palace with the gemstones. Officials who visited her court were gifted with emeralds. Such was the Egyptian queen’s passion for emeralds that she had her own mine dedicated to extracting these precious gems. Throughout Ancient Egypt, Emeralds were thought of as symbols of fertility and rebirth. The possibility of eternal youth in life after death was associated with Emeralds, as some mummies were buried with such gems. Roman emperor Nero was said to have watched gladiatorial games through an emerald for its supposed calming effect. The gemstone was also believed as a panacea for mental and spiritual illnesses. The Incas and Aztecs sought Emeralds as symbols of wealth and power, displaying them during religious ceremonies. Spanish conquistadors would learn about the gems when they sailed to South America. Spain’s colonisation of these South American civilizations led to the global trade of emeralds and their popularity in European monarchies. The Mogul Mughal Emerald, one of the largest emeralds in the world weighing 217.80 carats and standing 10 cm tall. Mughal royalty in India placed great importance in Emeralds, believing these gemstones were touched by the divine and provided good fortune. The Mogul Mughal Emerald is one of the largest emeralds in the world and is unique for having a date inscribed on it. It is dated to have been around 1695 to 1696. In the 1920s and early 1930s, emeralds were a primary focus in Art Deco jewellery, with the Mountbatten Bandeau and the Mackay Emerald by Cartier as the two most famous examples. Emeralds were thought to have truth-telling and future-predicting powers. Today, the emerald is regarded as a symbol of passion in relationships and hope for the future. It’s the birthstone for the month of May. Emeralds are valued for their colour, clarity, cut, and carat weight. Colour is the most important category when evaluating an emerald. There are three elements to consider: hue, tone, and saturation. For the hue, you want either a pure green or bluish green combination. The ideal tone would be not too light and not too dark. The deeper the saturation, the better the Emerald. Colour zoning, where one part of the stone is of a distinctly different colour, can be an issue. Because inclusions are common in Emeralds, clarity is not of the utmost importance compared to other gemstones. Emeralds are also often oil-treated to minimise fissures. Make sure to ask the seller if the emerald you are buying has been treated and to what extent. 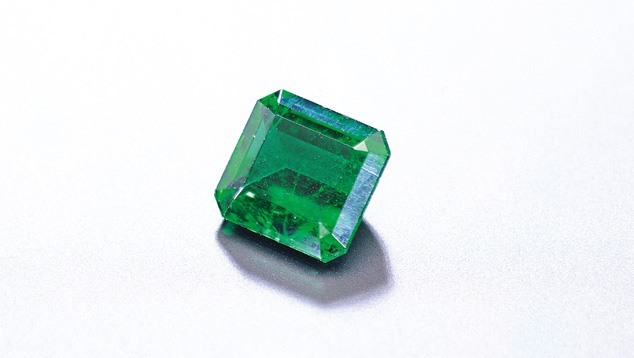 The cut of an emerald should highlight its colour. A symmetrical faceted cut shows an emerald’s features the best. It’s why the traditional cut for the gem is called “the emerald cut”. Much like any other precious gem, an emerald with a bigger carat weight is more expensive than a similar emerald with smaller carat weight. Do remember that colour takes priority over everything else, so a small but vividly green Emerald can command a higher price over a big but pale green Emerald. A synthetic Emerald is a fine choice for the budget and environmentally conscious. Lab-grown Emeralds have the same physical makeup of natural Emeralds with fewer inclusions. Although they are not as expensive as genuine stones, synthetic Emeralds are still quite costly. As Emeralds are relatively fragile, do not use chemical or high-heat cleaning methods. Ultrasonic cleaners are also to be avoided. Clean your Emerald jewellery by hand with warm water and mild soap. Make sure you dry the pieces completely to prevent water damage. Check out our other gemstone guides on Diamonds and Rubies & Sapphires to learn more!